When the ground is hard, the soil is nothing but mud and the morning frost grips all that is still living one plant is battling its way through. The little snowdrop may be small in stature but it certainly makes an impact at this time of year. Snowdrops are part of the Galanthus family. The name is derived from the Greek term gala which means milk and also anthos which means flower. Quite appropriate for a bloom known for its whiteness but there are some much coverted yellow varieties. A first glance you may think a snowdrop is just a snowdrop but there are 19 different species with over 1,500 hybrid variations. Like many things snowdrops were introduced to Britain by the Romans. The real interest in them was sparked when soldiers coming home from the Crimean War in the 1850s brought them back. The Victorians loved a bit of mourning and the snowdrops were planted in churchyards and cemeteries to remember the dead. This of course introduced new varieties to Britain. If the carpets of snowdrops that are out at the moment have got you wanting your own spread next year you can start planning now. Some suppliers will dispatch them 'in the green' with their leaves intact after they have finished flowering. If you miss your chance this spring wait until the autumn when you can plant them as dormant bulbs. As they spread over the years dig them up and divide. This will also give you the opportunity to discard any rotten bulbs or leaves that have developed. Snowdrops are big business now and not just in terms of visitors paying see them in gardens. With the number of varieties available they have become collector's items – these collectors are known as Galanthophiles. If you have a snowdrop variety missing from your collection then price doesn't become an issue when trying to acquire it. Prices for rare varieties have topped £1,300 for a single bulb – Galanthus plicatus 'Golden Fleece'. There has also been incidents of where entire clumps of rare snowdrops have been dug up to be sold on the horticultural black market. Who knew that the simple snowdrop can inspire such criminality? 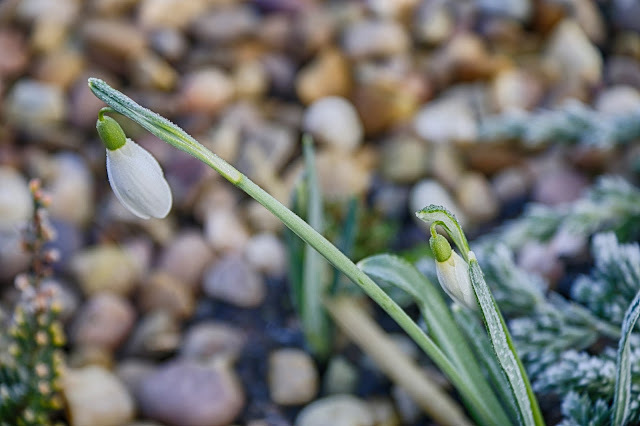 The National Gardens Scheme (NGS) is currently running its second Snowdrop Festival. Find which gardens will be opening for charity in February and March here. Snowdrops are part of the Galanthus family. The name is derived from the Greek term gala which means milk and also anthos which means flower. Quite appropriate for a bloom known for its whiteness but there are some much coveted yellow varieties. A first glance you may think a snowdrop is just a snowdrop but there are 19 different species with over 1,500 hybrid variations.